It ‘s hard to be ABD (all but dissertation), but I am continuing to plug away on my writing. I realized today that the way I have organized my work could benefit others. I am using three programs: EndNote, Adobe Reader, Microsoft Word, and OneNote. If you are a graduate student, check with your university to see if you have access to EndNote. This program allows you to collect your references. By connecting it to Microsoft Word, you can quickly add citations in several different styles (APA, Chicago, MLA, etc.). When you add a reference, you can also add the PDF file of the article as well. You can also group your references in any way that will work for you. 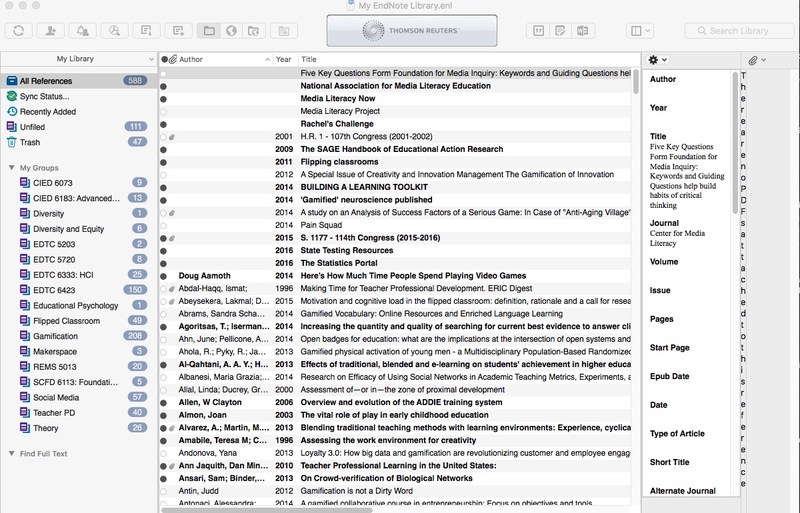 Is EndNote the best resource management system? Maybe. Maybe not, but it is the one that I started using. First love and all. I’m not doing anything fancy here. 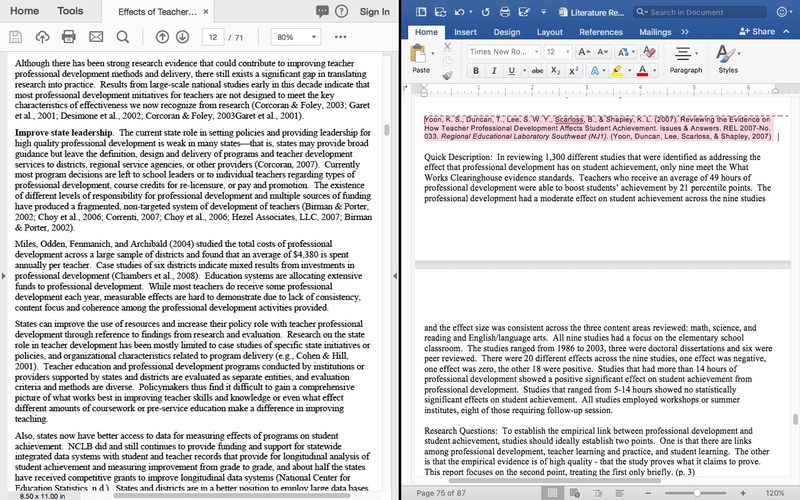 Using the Windows Snap feature or the Mac side by side feature, I put the Adobe Reader on half of the screen. I do sometimes highlight things I consider important or record a note. Adobe also has a cloud component so that you can read your PDF files from any internet connected device. 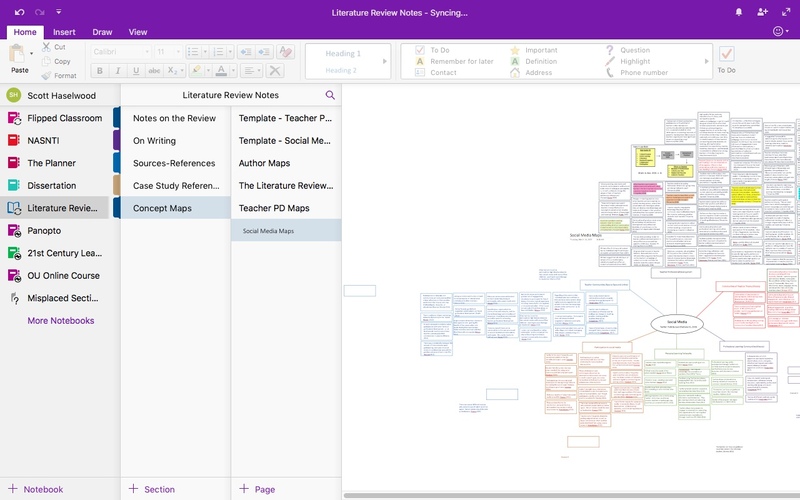 Now with OneNote, I set up a page for mapping ou t what has been read. OneNote gives you the ability to create several different notebooks; each notebook can be organized into specific tabs. Each tab can have several pages. Reading through all of the material will allow you to see what the major themes are. Each topic gets a specific color. Using those items and colors like spokes on a wheel, I added text from the outline that informs that specific theme. To make the chart easier to read, I added a box around the text. 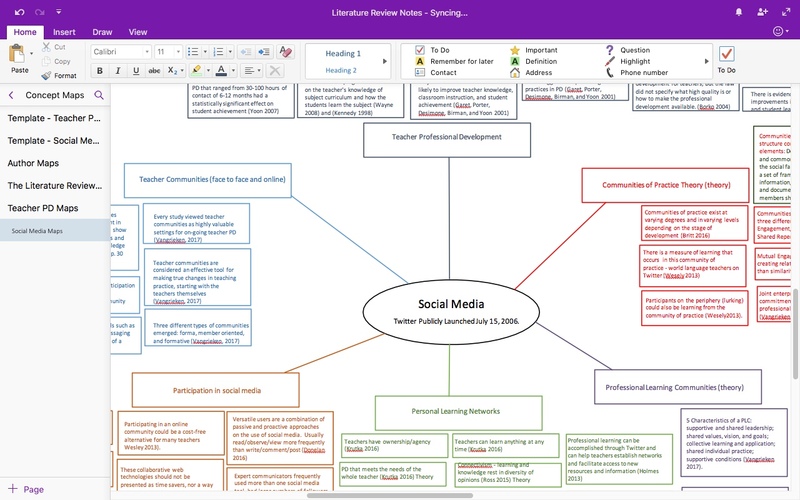 As the model develops in OneNote, it is simpler to write a coherent review of what the research literature is saying.